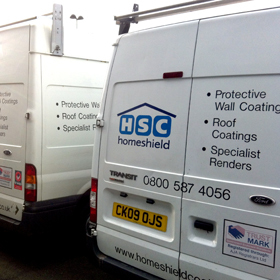 Homeshield Coating Ltd ~ Why Homeshield? Homeshield specialise in taking care of the exterior walls of your property. We repair, weatherproof , protect, decorate and keep out that Great British phenomenon… damp. What is more we guarantee to break the cycle of regular and frequent painting using our specialist materials and application methods. The UK's domestic property stock is wide, varied and of many different ages and construction types, we therefore believe in treating every property individually, assessing the wall type, construction, condition and ultimately the finish the customer is looking to achieve, for example.. do you wish to cover old weathered bricks, enhance the natural look of stone or modernise dated pebbledash. Homeshield has been "Protecting Britain's Homes" since 2001 and is the UK's largest specialist, domestic wall coating company. As such it has built a reputation for delivering specific, high quality installations to customers nationwide. We are members of TrustMark, Federation of Master Builders and are registered at Companies House. To find out more about our commitment to our customers please visit our Accreditation page. Trustmark are the UK's ONLY government endorsed quality mark to help you find reliable and trust worthy tradesmen to carry out work inside and outside your home. To search and check Homeshield's approval go to www.trustmark.org.uk and enter our Head Office postcode NP19 0LW and then search under "Painters & Decorators". All of these checks will give you - Peace of Mind. For your own peace of mind check out our 15 Year Guarantee.